As the name indicates, the new Transocean Chronograph 1915, launched at Baselworld 2015, commemorates a significant achievement for Breitling – a hundred years since the creation of the first independent chronograph pusher at 2 o’clock. A century ago, Breitling was one of the first brands to offer a chronograph for the wrist. In 1923 Gaston Breitling, who had taken over the reins from his father (and founder) Leon on his father’s death, also pioneered and patented a chronograph with the activation pusher at 2 o’clock, independent of the crown, thereby introducing the idea of clear delineation of this start/ stop function from the resetting function at the crown. Not content with this achievement, in 1934 Breitling introduced a patented second pusher for resetting, inventing the two-button chronograph. In this celebratory monopusher re-edition, Breitling has changed the 2 o’clock pusher in a more sleek and modern form than its originator introduced, but with an immediately discernible ‘vintage’ style and colouring to it. The Arabic numerals and baton hands are lumed in a shade that gives it that popular modern ‘faux patina’ look and the use of a vintage Breitling logo provides another signifier of the heritage of this new model. Inside is the new manual-wind chronometer-certified Breitling Calibre B14, with a patented two-tiered double column-wheel system activated by chronograph controls also arranged on two levels. Power reserve is 70 hours. 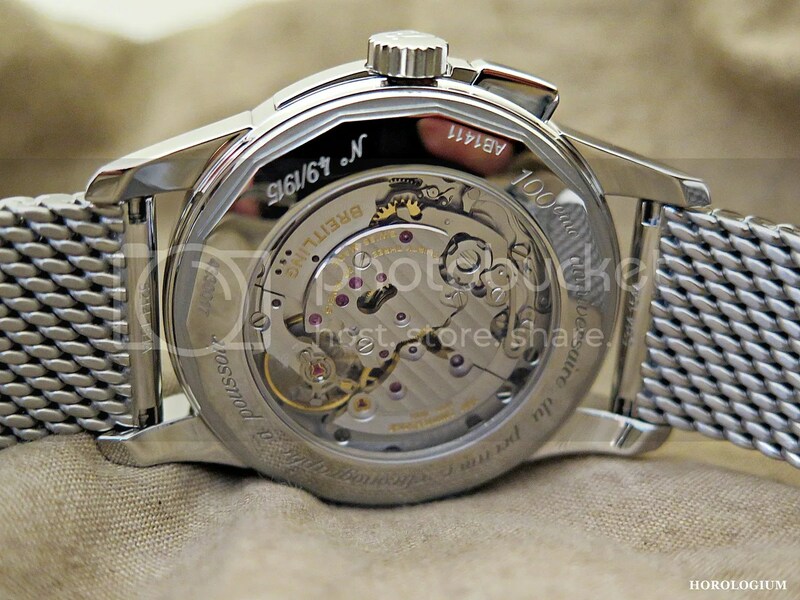 You can see the new movement through the sapphire caseback, which has a commeorative “100e anniversaire 1915-2015” (100th anniversary 1915-2015) engraving. In a 43mm stainless steel case, this new model is in a limited series of 1,915 and comes on an Ocean Classic mesh bracelet. 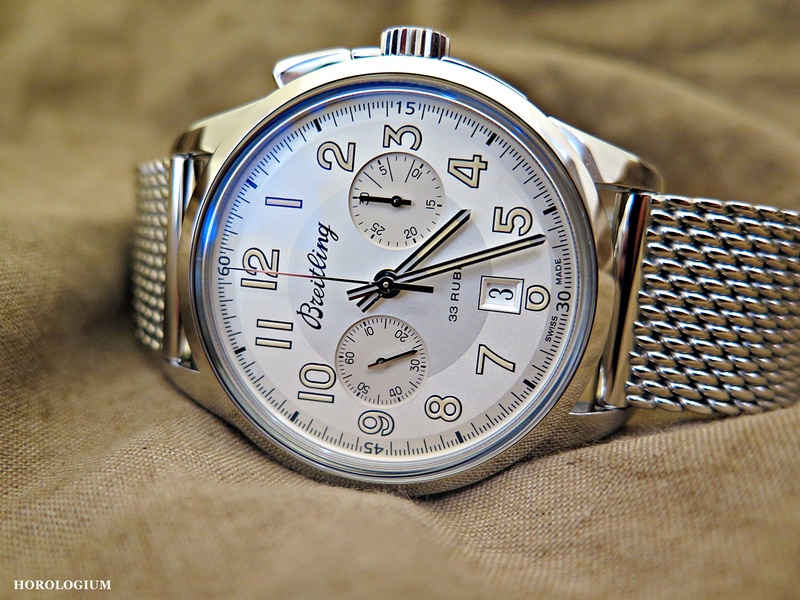 This is a good looking vintage/ homage piece, and my favourite from the Baselworld 2015 releases that I saw at the Breitling boutique in Sydney. Australian RRP is $11,960.